A new chairman and vice chairman have taken on the chains of office at Durham County Council. Cllr John Lethbridge was elected chairman at the council’s annual meeting, held at County Hall. He takes over from retiring chairman Cllr Bill Kellett. 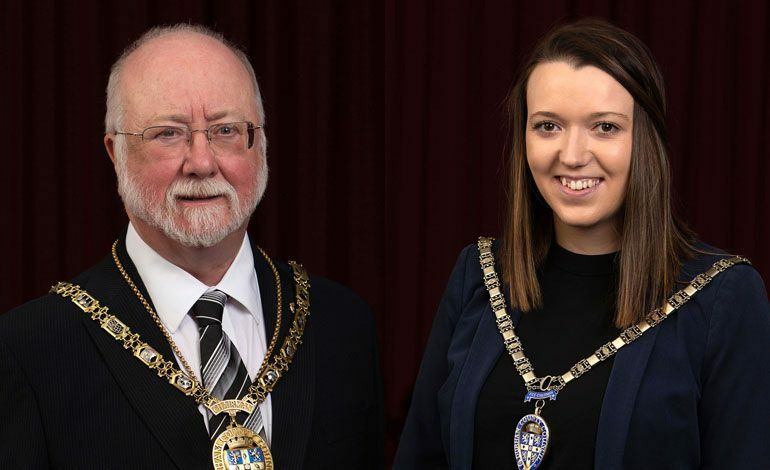 He will be assisted in his official duties over the coming year by Cllr Katie Corrigan, who, at the age of 26, is believed to be the authority’s youngest vice chairman. Cllr Lethbridge, who represents the Woodhouse Close ward, has been a county councillor since 2004 and has also served on Wear Valley District Council and Bishop Auckland Town Council. A former pupil of Broompark and Bowburn junior schools and Durham Johnston Grammar School, Cllr Lethbridge has a BA in Arts from the Open University and a Master’s in Education from Newcastle University. He qualified as a teacher in 1967 and spent his teaching career at Sedgefield Secondary Modern School until retiring in 2002. Cllr Lethbridge, who will also serve as mayor of Durham, is married to Sandra and has a son and daughter and two grandchildren. His chosen charity for his year in office is the Royal British Legion. Cllr Lethbridge said: “I’m honoured to be elected to serve as Chairman and represent the county council. Cllr Corrigan has represented the Belmont ward since being elected to the county council in 2013. She has also served on Belmont Parish Council, representing the Carrville ward from 2013 to 2017. She has a BA in Sociology and Politics from the University of Sunderland and worked for at Belmont Community Association for five years assisting with the administration and running of organisation across two sites.